Miriam Marino’s mother suffers from Alzheimer’s disease and is living with help of caretakers in her apartment in Buenos Aires, Argentina. Miriam was warned by her mother’s neighbor that she suspected possible abuse and decided to find out for herself. Discreetly installing a CCTV camera in her mother’s apartment, Miriam Marino decided to see what exactly was going on when her mother was under the care of her caretaker. However, she never expected to discover the horrific level of abuse that was going on. 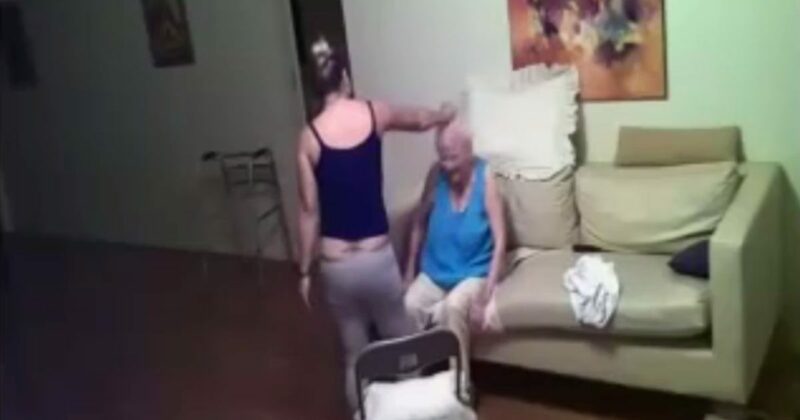 The disturbing footage shows the caretaker cruelly hitting her, kicking her and at one point even grabbing her hair and shaking her head. The sight is heartbreaking as the frail, elderly woman innocently sits there unable to defend herself.